LOS ANGELES — The surprising No. 21 Oregon Ducks continued their special season yesterday by dominating the final 3 1/2 minutes of their battle against No. 24 UCLA to win a huge game on the road, 76-67. The win moves Oregon to 16-2 overall and puts them in first place in the Pac-12 Conference with a 5-0 record. On Friday, Oregon center Tony Woods was receiving IVs to battle flu symptoms in his hotel room, forcing him to miss practice. Saturday, Woods had his finest game of the year, despite playing only 25 minutes. The big post hit eight of nine shots from the floor and two of three from the foul line to lead all players with 18 points. He also grabbed three boards. 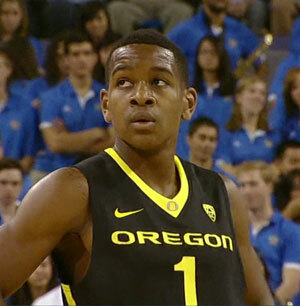 Oregon’s strength all season has been its dogged persistence at chasing down rebounds. Against UCLA, it was the difference in the game. 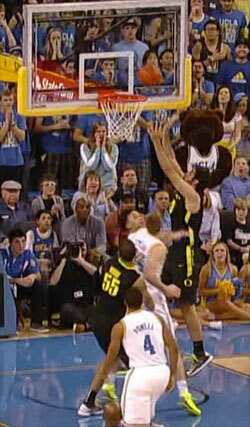 The Ducks out-rebounded the Bruins 40-31, including 13 offensive caroms. Those extra opportunities gave Oregon a 12-2 advantage in second-chance scoring, and in a game when the Ducks didn’t shoot well from two-point range, those extra opportunities were critical in the outcome, especially in the first half. Altman added, “UCLA can really score. We had a much better effort in the second half defensively.” The Bruins shot 55% from the field in the first period, compared to 37.9% in the second. UCLA led the Pac-12 in scoring going into the contest at 78 points per game and with 40 first half points, were on pace to score 80 before Oregon stiffened. The Ducks held UCLA scoreless for over five minutes midway through the second half, forcing the Bruins into eight straight missed shots. But behind the scoring of Travis Wear, the skilled transfer from North Carolina, UCLA battled back and trailed by only one, 62-61, with 3:30 left. At that point, the Ducks toughened and scored eight straight points, taking a commanding 70-61 lead before UCLA scored another point. That final run featured some terrific transition baskets, the result of some sparkling defensive possessions. The teams matched points in the final minute, and the celebration began for the upstart Ducks. Prior to yesterday’s battle of conference unbeatens, Altman bemoaned his team’s inability to hold or build leads to finish games. The Ducks nearly lost a lead in the final seconds in their upset over Arizona, barely held off ASU down the stretch, and blew a 10-point lead before hanging on to win by two points against USC. The Ducks, with their blend of youth and experience, have had real problems with turnovers during stretches all season. Some are forced, some unforced, and some are just real head-scratchers. Against UCLA, Oregon committed 16 turnovers for the game, about their season average, but had only one over the final 7½ minutes, despite the intense pressure it faced down the stretch. The gritty win snapped UCLA’s 10-game winning streak and gave the Ducks three important road victories to start the conference season. It also gave a national television audience watching CBS a chance to see the Ducks open conference play at 5-0 for the first time in 39 years, when it was still the Pac-8. It was the first Pac-12 game matching Top-25 opponents since 2009, and the teams didn’t disappoint. There were 15 lead changes in the first half before UCLA opened a late six-point lead to go ahead 40-34, the result of a 12-2 Bruin run. It looked like that would be the margin at intermission, but UCLA allowed the Ducks to cut the margin in half when E.J. Singler peeled off a double screen and drained a three-pointer at the buzzer. The shot provided the Ducks some badly-needed momentum going into halftime. Four Ducks scored in double figures as Dominic Artis, 14, and Damyean Dotson, 11, joined Woods and Kazemi. It was almost six players, as E.J. Singler and Carlos Emory each scored nine. Artis added six assists to lead the Ducks, and Dotson pulled down six rebounds. UCLA Coach Ben Howland held out freshman Shabazz Muhammad for the first 12 minutes of the game because the Bruin star was late for Friday’s practice. The high-scoring forward, who averaged 18.4 points going into yesterday’s game, ended up with 10 points. Kyle Anderson had a double-double for the Bruins as he scored 10 points and pulled down 11 rebounds. Before the UCLA contest, Altman was frank in his assessment of his team. 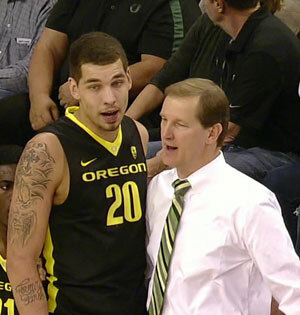 Despite becoming ranked for the first time in his tenure at Oregon, and despite winning six games in a row with a glossy overall record, Altman was not satisfied. After the impressive effort the Ducks displayed at the defensive end down the stretch on a big stage at Pauley Pavillion, Oregon is certainly a step closer to accomplishing what it wants in this increasingly special season.